Growing up, my mother and my aunt both made incredible soups. Taking the best components from each and creating this deluxe version. We have been able to deliver not one but two awesome soups in this recipe. The base for this recipe is a flavorful and aromatic chicken soup, which is fantastic to serve by itself. This chicken soup is a personal favorite of my wife’s. 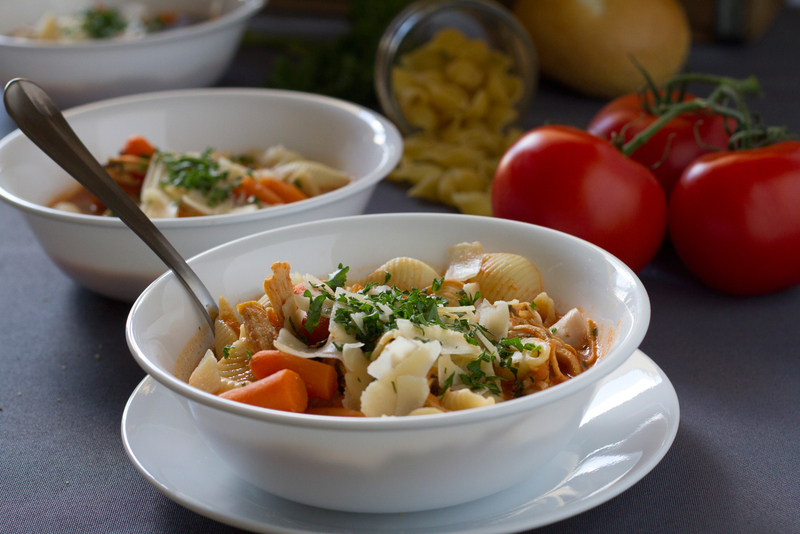 While the chicken soup is a great standalone meal by adding just three extra ingredients it becomes a rich, creamy tomato chicken that seems to be a favorite of everyone. You can easily double or triple to make a batch portion for large families or gatherings. At one time I was living with 12 family members, so I created recipes like this to help feed a large household easily and for a fair price. Leftovers are great for 4 – 5 days and make a great lunch. Mix it up and enjoy with a grilled cheese or egg salad sandwich. Serve either soup over a bed of pasta, rice or tortellini in a bowl. In a medium 4 Quart pot or saucepan combine chicken breast, carrots, all dry ingredients and 8 Cups (2 Quarts) water. Bring to a boil, cover and reduce heat to medium-low and simmer for 45 - 55 minutes or until carrots are soft and tender. After simmering, remove chicken breast from soup and place onto cutting board. Use two forks to pull apart and shred the chicken. Return shredded chicken to soup. Cover soup and return to a simmer for another 15 - 20 minutes. 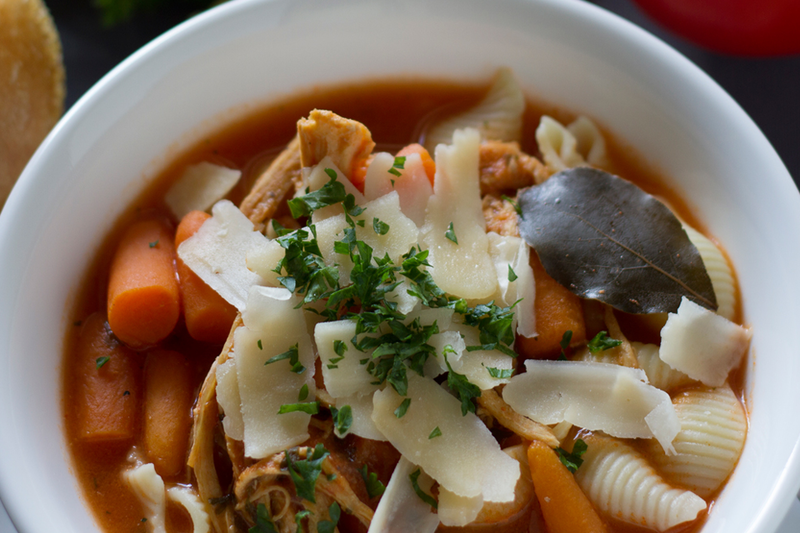 Serve over a bowl of pasta or a bed of rice in a bowl for a flavorful chicken soup. Separate a cup of broth from chicken soup base and pour into medium mixing bowl. Add tomato paste and whisk paste into broth until smooth and combined well. In the same bowl with the tomato mixture, add 4 - 8 ounces of sour cream. For a richer tomato soup, start with 4 ounces and add more if you would like a smoother, creamier tomato soup. Remember: You can always add more but you cannot take any out. Whip sour cream with whisk until there are no curdles and mixture is smooth. Return tomato mixture to soup. Bring to a low boil, then cover and reduce heat to medium-low and allow for a simmer. While soup simmers, cut the tomato into quarters. Then, use a cheese grater to shred the tomato down to the skin over a medium sized bowl. Toss out the skins and add your homemade tomato puree into the soup. Continue to simmer covered for 10-15 additional minutes. The longer your soup simmers the more flavorful it will be. Soup may thicken after cooling. Serve over a bowl of pasta or a bed of rice for a rich and creamy tomato soup. Be sure to refrigerate leftovers immediately. If soup becomes too salty from evaporation at anytime you can add a small amount of water. You can use a light or fat free sour cream as a substitute to save on fat and calories in your cooking. Keep in mind a lighter sour cream may result in a less creamy soup, so extra may be needed.